One of the key criteria common throughout Industrial screen printing applications is the need to produce a consistent quality that meets the customer’s performance specification. This could range from the legibility of 5 point text on a medicine ampoule, to the electrical resistance of a 50µ track on a photovoltaic panel. Typically, the screen printed component of an industrial application is a low cost part of the operation, but if it fails the customer’s performance specification, it can have a huge consequential cost. Whatever the specification you require, a poorly designed screen making facility can create an expensive, wasteful and sometimes even dangerous bottleneck in a production facility. Screens that are not prepared properly breakdown quickly, as do screens that are not dried or exposed effectively. Cross contamination can lead to rejects, whilst expensive mesh can be destroyed in seconds due to poor storage and handling. However, with only a modest investment you can easily create a more profitable screen making facility that is safer, effective and efficient with the right design. The type, size and number of screens you produce have significant influence on the design of the screen making area. For example, making 20, 3m x 2m screens per day for automotive glass printing will have different equipment and space requirements than making 500 compact disc screens a day. However, the fundamental screen making process remains constant whatever the application and therefore the same work flow rules apply. 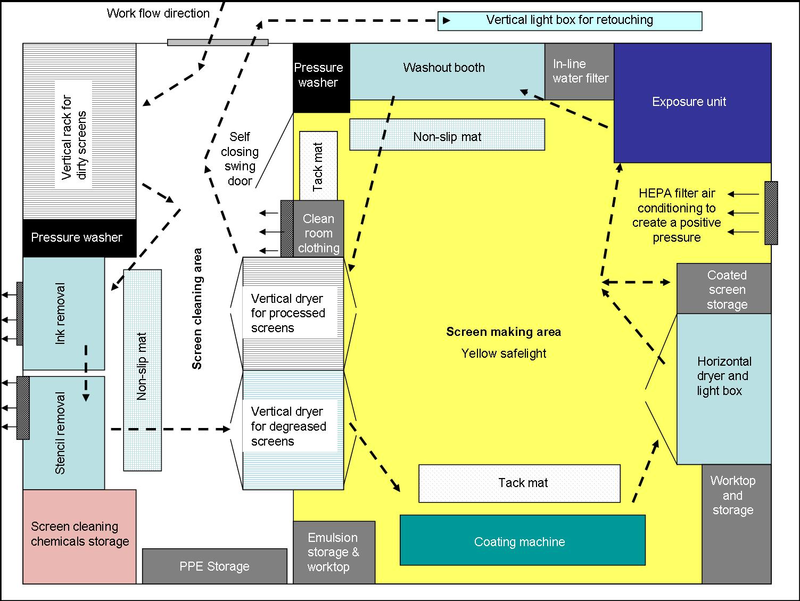 The design covered in this article shows one suggested layout for a manual screen cleaning/making department that predominantly processes direct emulsion and Capillex screens <1m² in size. For example: a membrane touch switch application. If greater throughput is required, many of the following operations may be automated, but that is beyond the scope of this article. Ideally the wet, messy screen cleaning area needs to be separated from the clean, dry screen making area to prevent cross contamination. On the left hand side of the plan below is the screen cleaning area, which takes the dirty screens that have been printed, cleans off the ink and stencil and then prepares them ready for the next stencil. This is the wet, messy part of the operation and it is physically separated from the clean, dry area by a wall. The clean and dry screen making stage (on the right hand side of the plan below) starts with a dried degreased screen, which is then coated or stencilled with Capillex film, imaged, processed and then sent out for finishing prior to printing. The screen making workflow (shown by the dashed arrow), demonstrates how screens are processed with minimal handling through the department. This area does not need to be yellow safelight as it is easier to inspect a clean screen in white light. The very nature of the process means that it will get wet and dirty in the room, so the floors must be non-slip when wet and the surfaces easy to wash down. Good ventilation for the operator must be provided due to the chemicals used there. To minimise the risk of screen damage and to improve the work flow, the dirty screens should be stored vertically in a racking system next to the cleaning booth prior to cleaning. By storing the screens in a rack this reduces the potential for accidental damage which is all too common if the screens are just stacked against a wall. In many industrial applications there is a standard screen size so the screen racks can be made portable. This allows them to be filled up in the production area and then wheeled into the screen cleaning area ready for cleaning. Ensure there is good ventilation where the operator is using solvents and that you draw away solvent vapours from the operator’s face. Installing a simple solvent recirculation system will save you money very quickly. 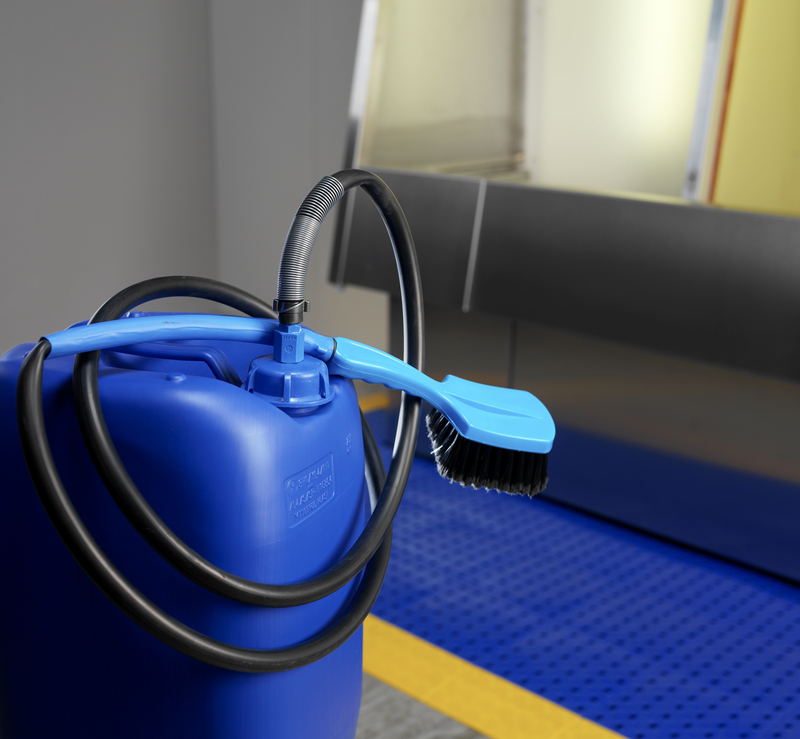 Using special screen cleaning brushes will maximise the efficiency of the cleaners and minimise the potential to damage the mesh. These brushes have chemically resistant fibres that have ‘flagged’ ends to give good solvent pick up and minimise dripping. The stencil stripping washout booth must have a backlight for inspection of the screens during cleaning. The booth must be fitted with both a mains pressure water supply and a pressure washer. This will enable the operator to rinse the chemicals off the screen before blasting it with the pressure gun. IMPORTANT: Never rinse chemicals off the screen with a pressure gun as this will atomise the chemicals which can cross contaminate cleaned screens, or worse still, be breathed in by the operator. Top tip: The Autotype Brush Pump is a very simple way to apply stencil stripper to the screen without the need for an electrical or compressed air supply. The area in front of the cleaning booth will get very wet, so additional non-slip mats or ‘duck boards’ are a good idea. Screen cleaning chemicals, especially solvents should be stored in a metal cabinet suitable for storing flammable liquids. Ideally these should be raised off the floor slightly to prevent them rusting in this wet environment. After the screens are cleaned, they should be degreased and rinsed before drying. The water supply used for the final rinse should be filtered using an in-line filter to prevent waterborne contamination being filtered out by the mesh and clogging the mesh openings. Typically these particles of rust or limescale will show up as dark spots in the stencil once the screen has been coated, which will lead to pinholes. There is no such thing as ‘a safe chemical’, only safer ones, so the full range of personal protective equipment (PPE) should be easily available for the operators to wear. The PPE must be both effective and comfortable; for example face shields are more comfortable than safety glasses and will protect the whole face from ‘blow back’ when using a pressure washer. A full length apron will keep the operator dry when cleaning many screens. Make sure the gloves are fully resistant to the chemicals being used as some protective gloves are not suitable for use with solvents. Always use long gloves when handling corrosive caustic haze removers as they will protect the operator’s forearms as well. 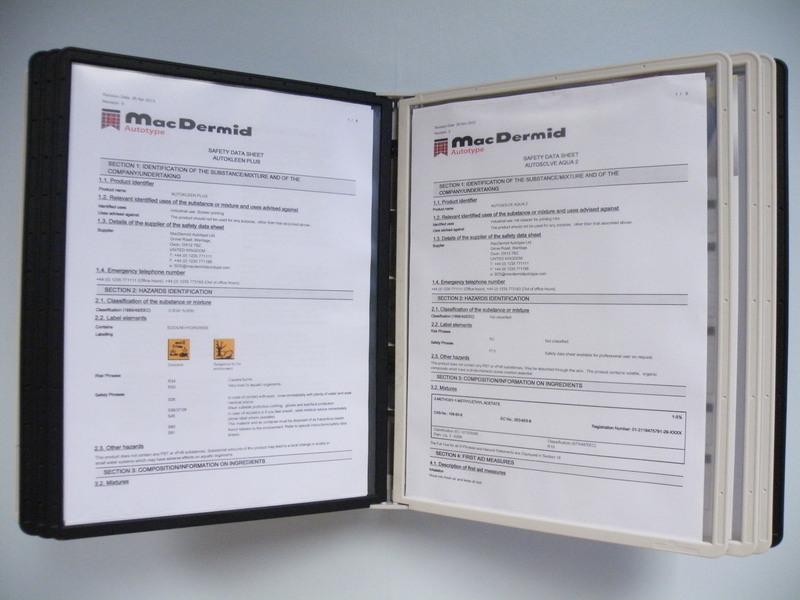 It is a good idea to keep separate copies of the current Safety Data Sheets (SDS/MSDS) immediately to hand in the areas of chemical use. Ideally, these should be in wall mounted document holders as this means they are permanently on display and allow you to locate data quickly. 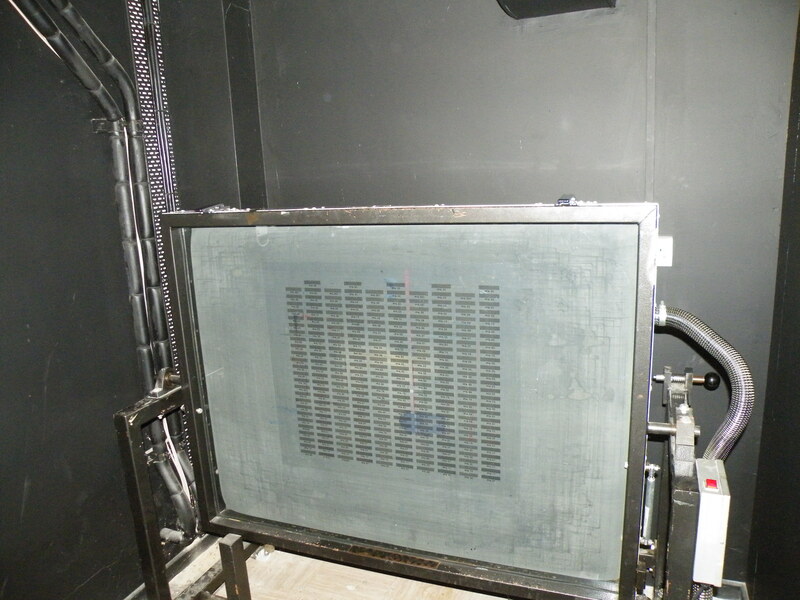 The cleaned, degreased screens can be placed vertically in a warm air dryer to dry. If the dryer is built into the wall between the two areas, screens can be loaded in from the screen cleaning area and then accessed from the stencil making area, preventing unnecessary movement in and out of the stencil making area. This will reduce the cross contamination, minimise the potential for damage and subsequently improve operator efficiency. 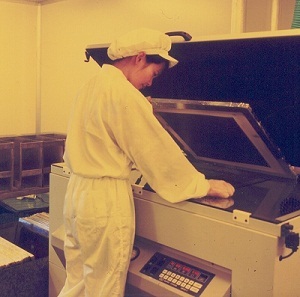 The working environment in the stencil making area should be in yellow safelight and air conditioned to 18–22°C and 50–55% relative humidity. Get rid of any unnecessary clutter as this creates a dust trap. Concrete floors and suspended ceilings can create a lot of dust. Sealing the walls, floor and ceiling will prevent dust being created or retained. Do make sure that whatever method is used complies with any local fire regulations. Use easy clean surfaces and try to reduce the number of areas where dust can accumulate i.e. storage cupboards should not have a gap underneath which is difficult to clean. Reduce unnecessary movement in and out of the room by having load-in/unload-out in-wall dryers. 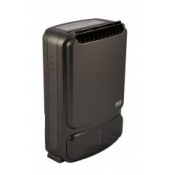 The air coming into the room should be HEPA filtered and ideally at a slightly higher pressure than the screen cleaning room. Tack mats placed by the door and in front of the coating machine remove most loose dust from operator’s shoes. Try and reduce clutter being accumulated by providing adequate storage for the essential equipment and consumables. Minimise air movement near to the critical operations such as screen coating (dust is impossible to remove once it is embedded in a wet emulsion coating!). Use only lint free cleaning wipes. Most contamination comes from people. Cleanroom clothing; especially hair nets/hoods/caps will have a huge impact on dust reduction. Store the cleanroom clothing as close as possible to the entrance, or create an air-lock where operators can put on the cleanroom clothing before entering the room. 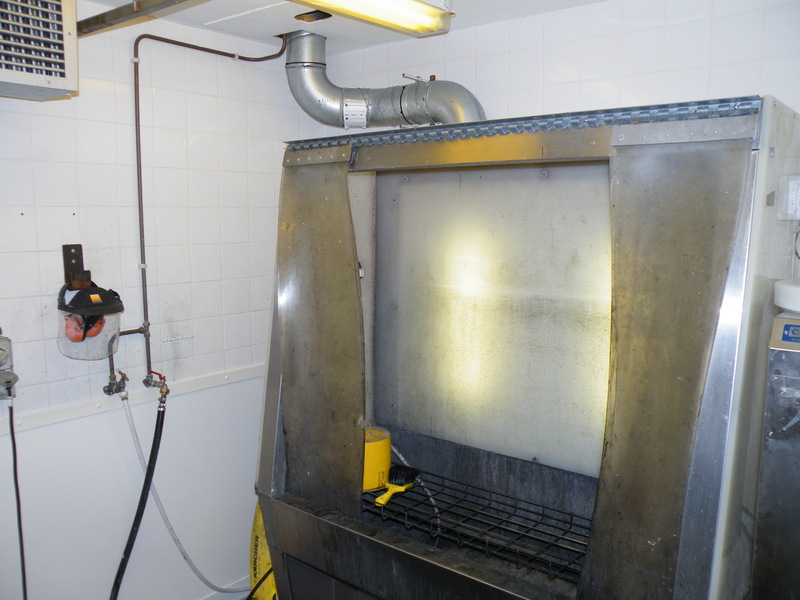 The dried degreased screens should be taken straight from the dryer to the coating machine to minimise exposure to airborne contamination. Establish a weekly ‘deep cleaning’ regime to prevent dirt accumulating. Create a culture of ‘keep it clean’ so any spills or drips must be cleaned up as soon as they happen. Top Tip: A simple check to see if your safelights really are safe is to place eight coins in a line on a dry, coated screen that has been left out on a worktop. Remove one coin per hour and after eight hours wash out the screen. If your safelights are completely safe the stencil will wash off completely. However, if any coin images remain visible this means the stencil has been fogged/exposed by your safelights. As each coin represents one hour’s exposure, the maximum safe working time can be determined. Clean up emulsion spills and drips immediately to avoid a dirty and difficult to clean coating machine. A lot of contamination comes from a build up of dried emulsion accumulating around the rim and lid of the emulsion container therefore ensure you wipe clean after pouring the emulsion into the trough. Top Tip: If you are using a one-pot emulsion, a dispenser pump fitted to the lid can eliminate the need to repeatedly open the emulsion container pot. Small variations in the depth of the emulsion in the trough can have a noticeable effect on the amount of emulsion deposited with each coating pass. If ink deposit is critical, then try to maintain the same emulsion depth in the trough for each screen being coated. Coat slowly to minimise entrapped air, this is especially important when coarse mesh counts are used. The condition of the coating trough edge is critical for good coating quality. Always wipe the trough clean with a damp sponge in-between coating screens – it is much easier to clean off wet emulsion than dried in emulsion! Coated emulsion screens must be dried horizontally and print side down, however, Capillex screens can be dried print side up, as the polyester backing film will protect the stencil from drips. The drier must use warm, dry air <35°C and <40% RH. The wet air should be exhausted out of the dryer, or recirculated through a dehumidifier to remove the moisture. Screens simply won’t dry properly in a hot, humid box! Exposing a ‘damp’ stencil will lead to a very soft, weak stencil that will quickly break down on the press. Do not leave dried screens in the dryer for longer than necessary; remove to a sealed storage cabinet when dry. Using too hot air temperature >40°C will harden the emulsion making it impossible to washout. The UV exposure can either be free standing or a self contained unit. Selection comes down to the size of screens and minimum line resolution that is required. In order to minimise the light angle entry into the image, the UV source should be positioned as far from the vacuum frame as practical. Ensure the UV bulb is fully compatible with the photochemistry of the stencil, as a mismatched combination can lead to very long exposure times or weak, soft stencils. IMPORTANT underexposure is the single biggest cause of stencil breakdown on the press. Top Tip: Try to minimise unwanted light reflection by painting the walls matt black. 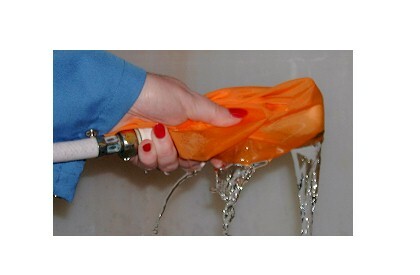 The washout booth should be fitted with both a high and low pressure water spray to ensure complete washout. If it is not practical to install a pressure washer, then a compressed air boost can provide a good washout spray pressure. 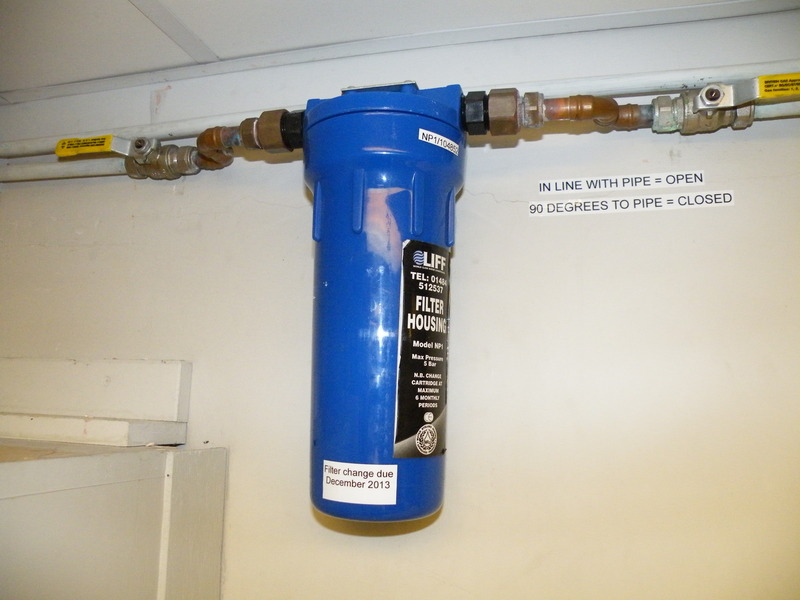 The water supply should be fitted with an in-line filter to remove waterborne contamination. This is especially important if Capillex stencils are being applied to a wet screen. A good backlight is essential for screen inspection, as this is in a yellow safelight area the backlight should be yellow, or if not practical, a white light can be used as long as there is no chance of it fogging other screens waiting to be processed. 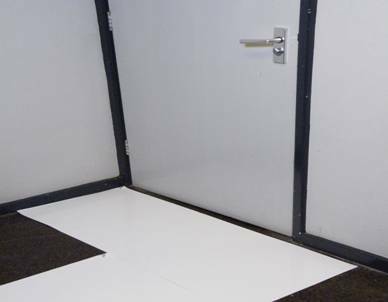 An easy clean, non-slip mat should be positioned in front of the washout booth as this area will become wet quite quickly. 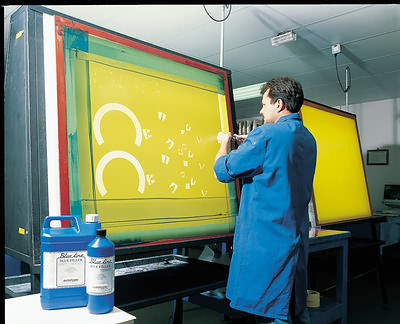 After the screen has been washed out, the processed screens should be positioned in a vertical screen dryer that is accessible from outside the room ready for re-touching prior to printing. A near-vertical screen inspection light box is the most practical for all but the smallest of screens. Designing an efficient and effective screen making area does not have to be costly and most companies will find that the modest investment required is recouped many times over through the improved productivity. It is also about investing for the future. Safe, clean and efficient work practices cultivate an environment for the operators that will enable them to progressively improve the quality of the screens produced. This has to be a pre-requisite to meeting the ever growing requirements for quality screen printing. This entry was posted in How To, Screen Printing and tagged Capillex, Direct Emulsion, Films, Industrial, Industrial Films, Screen making. Bookmark the permalink.